A black screen with a lightly pulsing percussive score, so faint it might be a spill from one of the other cinemas. 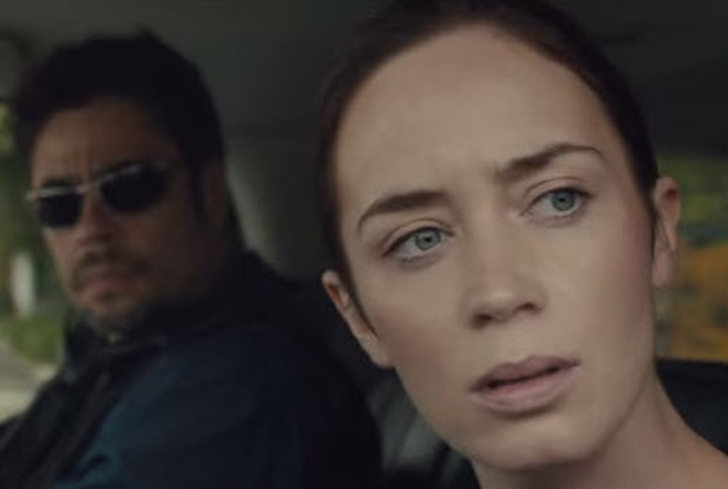 A title card, white on black, explains that Sicario is a term from the Roman occupation of Jerusalem and referred to the vigilante zealots who would hunt down and kill key colonisers. It was adopted by the Mexican and further southern drug cartels and came to mean hit man. This is a film about vengeance. We open on an FBI raid as agents in field armour move in while an APC heads towards a house in Arizona. The APC crashes through the walls and the agents spill out, shooting everything that moves. They don't find their objective but instead discover that the walls are stuffed with rotting corpses in plastic. Outside an agent fiddles with a locked trapdoor until it explodes, leaving a crater and piles of dismembered agents. Later that day, the leader of the raid, Kate Macer, and her second in command are sitting outside a glass walled office while their boss confers with a group of men whose anonymity gives them importance. One of them calls Kate in. She's not in trouble, despite the day's mishap, she's being offered a job to help an anti-cartel operation with Matt (no surname) who is carved out of rock and might be CIA or weirder. Kate is given the distinct hint that if she volunteers for this she might have to go into some very dark territory. It also might lead them to getting the guy who organised the bomb in the shed. She says yes. Turning up at the base for her first assignment, her second in command is dismissed and she is put on a plane with Matt and the mysterious Alejandro who, when asked what his role is by Kate says it would be like explaining how a watch works and sometimes it's best just to know the time. From this point Kate is taken further and further into action that is only ambiguously legal and her conscience is under constant stress. And that's when you notice something strange happening. Kate's sense of vengeance fades from the narrative. It is taken over by another for an act that has happened outside the timeline. The character who bears the titular role of avenging force while he started on the sunny side of the law has become so much a part of the weave beyond legality that there is no return for him. And when his confrontation arrives it plays out without significant tension release. At that moment it becomes clear why the strangely unengaging evenness of pace this film has insisted on has been completely deliberate. We are asked to be cool-headed, to be witnesses rather than moviegoers. This is not to say that the action scenes you expect from the opening aren't compelling. They rivet. It's just that the effectiveness of a given operation is offset at all times by its cost. While the tension of the traffic scene is white knuckle the energy drains as we are given pause through Kate to ask about the blurred lines between the sides. The difficulties of this suggest not only the futility of the declared war on drugs but points (sometimes unsubtly) to the same quality in the war on terror. Without decent writing and performances this would be as limp as official propaganda. The film's refusal to indulge the machismo of the government agents or distinguish it from that of the cartel players is key. The resulting question about how much point there is in combating the organised drug trade finds its answer in the stated objective (which involves spoilers so it won't be stated here) and this is the thing that delivers the gut punch. That punch is felt in slow motion in the epilogue sequence which involves the kind of elegantly brutal juxtaposition that an Oliver Stone or Michael Mann would envy. As for performances they are strong throughout with the three part pivot shining. Emily Blunt, so energising in Edge of Tomorrow, plays Kate with the same intensity as an athlete moments after the event, serious, focussed and alert. Her deep, staring intake of the information around her singles her out among the uniforms before her gender does. Even when she's relaxing it's more like keeping her sense of hazard at bay. These things prevent her outrage from getting didactic. At no time does she come across as bureaucratic which her lines alone might. Her counterpart, the Mt Rushmore-faced Josh Brolin, owns the rooms her enters and enjoys knowing it. His effortlessly imposing physicality and wisecracks might set him up as the centre of any other action film but the lines are understated and his calculated force precise, betraying a coldness beneath the cowboy exterior that keeps us from indulging him as an action hero. We are thus forced back into Kate's position of questioning him. Benecio Del Toro is similarly physically intimidating but it's the lack of easy information that makes him a threat. While his apparent care for the alienated Kate feels genuine we are not surprised to see it vanish with his self interest. The silence at the centre of his self-restraint hides something we've only seen suggested in an early scene and soon begin to dread. Del Toro's use of his ursine physicality has a tense economy to it, hiding more power than he needs to show. There are a number of establishing aerial shots of landscape taken at a great enough height to make the geography look otherworldly: frequently beautiful but with the same threat as brightly coloured poisonous plants. In one, the shadow of a small jet plane slithers over the undulating greens and pinks below, serpentine and deadly. This is more Kathryn Bigelow than Michael Mann and, as with the former, there is less fetish about the depiction than a trust in the power of its line and colour. Similarly, when a service pistol is expertly dismantled in a late scene we think less of the skill in the field stripping demonstration than in the slightness of the difference between it being chunks of metal and a killing device. Johan Johannson's score moves seamlessly between electronics and orchestra and is spare and grave. As one who notices the music in films and can be turned off by overscoring or over-reliance on the bamming effects used by poorer composers, I am always appreciative of good work. The music here is as focused and serious as the film as a whole, supporting the seriousness of the fare and never congratulating the violence we must see. I know little of director Denis Villeneuve's other work beyond titles but after this I'll make it my business to catch up. By keeping us looking at the conscience of the piece through hard muscular skill he has made this genre grow a little. Do you like your political action movies to deliver great thrills but also compel your thoughts? You should.